We Start with the Best! A strong basis for our herd! The Godley family has ranched and run cattle for at least four generations and raised registered cattle for about ten years. Over the years, we have calved and raised practically every type of commercial cow imaginable - all in a commercial setting. That comparison of running different breeds has given us an appreciation of the value and POWER of the ANGUS COW. 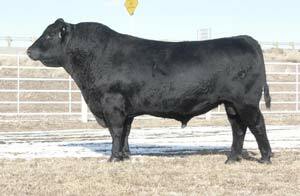 Commercial experience has proven invaluable in the philosophy behind the breeding of our registered Angus herd, and is the basis of our breeding program.The Godley Angus Registered cowherd is managed much the same as a commercial producer runs his herd. The cows don't get special treatment, and must perform for us the way you would expect them to perform for you - as range cows. (As opposed to being treated like dairy cows!) 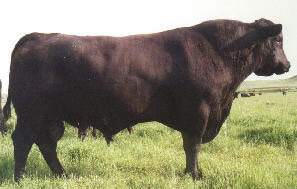 Regardless of bloodlines, our own herd bull selection must emphasize GOOD MATERNAL TRAITS. Translated, that means, good udders, moderate birth weights, easy fleshing ability, sound structure, moderate size, large scrotal --- all of which enhance the longevity of the cow. We feel these are the type of cattle that are suited to our Wyoming environment.